Google Flood Help is a digital platform that helps Canadians assess their flood risk and navigate a sea of confusing flood insurance regulations. Flood Help will be adaptable to changing weather circumstances leveraging Google's expansive data in mapping and computing to provide people with help that ranges from quick tips to long term protection solutions. The 2013 Calgary and Toronto floods changed many things for Canadians, from the way we plan our city to our relationship with the waterways around us. There was the financial cost, as well — millions of dollars were swept away by the flood waters that year, along with any ideas that a major disaster could ever befall a modern cities. In the end, 2013 ranked among the costliest years for insurers in Canadian history. I have insurance. I’m fine…right? People had the mistaken idea that “I’m fine” should there be a major flood. The 2013 flood was unique, in that there was water backing up into people’s homes through sewer lines and through overland flooding which destroyed communities and homes. What ended up happening was that insurance companies would compensate for the sewer backup as per their insurance agreements. But some of these companies could not cover the damage caused by the water coming in from other sources, such as through the ground. The right design solution needed to encourage homeowners to take action and learn about flood risk and insurance regulations, while also addressing divergent levels of need and preparedness. 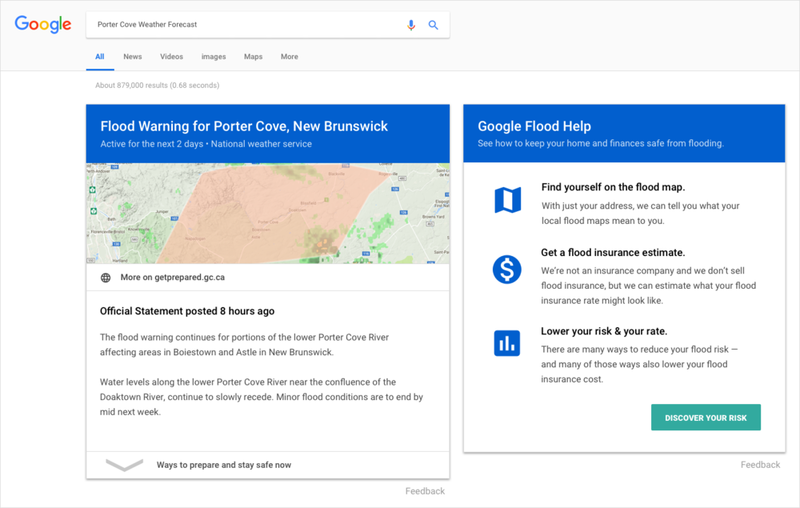 Google Flood Help is a digital platform that helps Canadians assess their flood risk and navigate a sea of confusing flood insurance regulations. Given that there is such a wide variety of homeowners with different levels of tech comprehension, the service needed to be discoverable. Therefore, the first thing I focused on was discovering natural entry points which are accessible by all kinds of homeowners. To better reach homeowners of all types, I am proposing a service that would be built on top of Google Crisis and would be accessible under search. I analyzed and dissected flood insurance quotes from various providers such as SquareOne and Aviva to determine what details were needed for user onboarding and what could be shown/edited later in the process. The insurance questionnaire process can seem daunting and require a lot of information, so the aim here is to spread out the content so that it would make the experience easier and lower cognitive overhead. In collaboration with Intact, the City of Toronto is supporting a new pilot program – the Toronto Home Resilience Program. Residents can participate in the Toronto Home Resilience Program to receive emergency preparedness resources and a 50-point flood risk assessment that identifies priority actions to reduce basement flood risk free of charge. Emergency preparedness resources for Toronto residents. 50-point visual inspection of flood risks inside and outside the home by a trained engineer. Confidential report that identifies top actions homeowners can take to reduce risk of flooding. Optional follow-up phone call with your inspector to discuss the report. Optional seasonal maintenance reminders sent to you via email. As the price of installing solar has gotten less expensive, more homeowners are turning to it as a possible option for decreasing their energy bill. Project Sunroof wants to make installing solar panels easy and understandable for anyone. Project Sunroof puts Google's expansive data in mapping and computing resources to use, helping homeowners calculate the best way to go solar. Google Crisis is a collection of national and regional-scale layers related to weather, hazards, and emergency preparedness and response. Google works with local authorities and first responders to provide access to critical information and resources when people need them the most. Discovery: Here is a good opportunity for Flood Help to get people to start thinking about their flood risk by attaching itself to relevant crisis posts. Coming from Google Search, the home page needs to encourage both groups of homeowners to take action and learn about flood risk and insurance regulations, while also addressing divergent levels of need and preparedness. Information Strategy: The intent is to encourage homeowners to enter their address to begin, show how flood help works, and provide some statistics to facilitate a conversation between Google and Homeowners. In the image below, I am bringing Google News into the experience to provide comprehensive, up-to-date news coverage, aggregated from sources all over the world. Floods of every type do not happen all the time in a lot of areas and to many homeowners can be thought of as an issue that is not relevant to them. Therefore, it is important to introduce some form of storytelling which allows the viewers to empathize and feel connected to ongoing flood events. The dashboard helps homeowners learn what flood zone they are in, or will be in and how that effects their insurance rates, and what steps they can take to mitigate their risk. Google is able to collect this information already through crisis and solar saving’s address search. Some design decisions here are listed below. High-level Overview: There is a lot of information to digest in regards to relevant insurance regulations. I approached this task by starting off with a high-level overview to help homeowners gain a quick sense of the types of information rather than showing it all at once. Visual Design: I wanted to introduce icons, colours and images where possible to create clear calls to action and give the dashboard a lighter and more approachable feel. 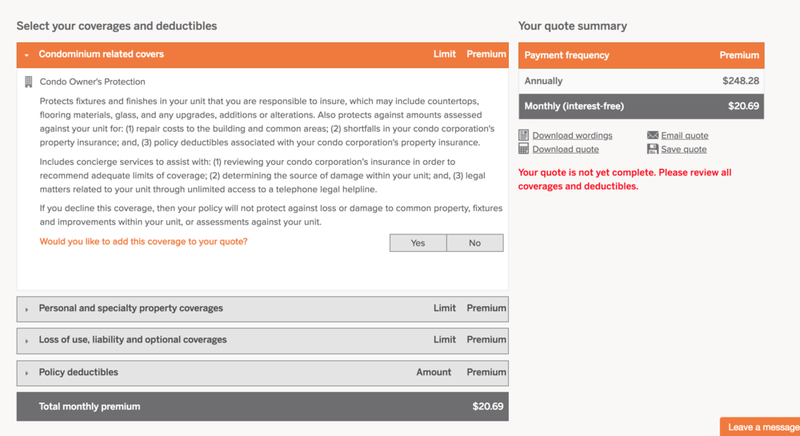 The process of obtaining an insurance quote requires people to fill out a long form with a variety of questions. I based the questions off of insurance providers that currently offer overland flood insurance. Questionnaire: By only presenting the minimum number of questions up front and splitting them into individual screens, the quoting process becomes easy to complete. To Create Recall: Build recognition over time, removing the cognitive load to understand the interaction in a single instance, and allow the user to move more quickly through the product. To Add Clarity: Icons leveraging universal meanings to create a more accessible product by visually reinterpreting text. People might not have information on coverages and deductibles handy and would then be unable to move forward within the initial quoting process. This is why we move those details to the end so homeowners are able to tweak their coverages and see them update live. Recommended Actions: Here is a good place where Flood Help can give recommendations to homeowners to help them lower their rate. I first present the result calculated from the quoting process, then list out ways homeowners can improve the quote that they received below. Post-Service: Finally, Google isn't an insurance company, but we can direct users back into Google Search by helping them get started in finding trusted insurance providers to complete the experience. Putting Google's expansive data in mapping and computing resources to use, Canadians can be equipped and ready to respond to unpredictable flood events in the future. This kind of framework can also be applied to cover issues beyond climate events. I designed this service with a modular approach in mind. This means that we can keep up with ever-changing flood insurance regulations to cover from resiliency tips to the quote questionnaire. The drenching rains and massive flooding caused by Hurricane Florence are expected to inflict a high financial toll on homeowners in North Carolina and other states, as only a small percentage are covered by flood insurance that could help offset the costs of rebuilding their damaged homes. Only 10% - 20% of coastal homes have government provided coverage. Only 1% - 3% of homes in inland communities have flood policies. The numbers of those covered are low because people think that because their home isn't in a high-risk zone designated by the government that there's "zero risk" of a flood. "But that's not true," says John Rollins, Actuary at Milliman. Many also don't realize their basic homeowners policy doesn't cover flood damage, while others overestimate the disaster aid they will get from the government. Sparked by a design challenge, I knew I wanted to address the ongoing flooding crisis. However, it would be impossible to do a meaningful project addressing the crisis as a whole because of its incredibly complex problem scope. Although some companies are now offering overland flood insurance, much of this information is still unknown to many people. We are expecting extreme weather events to occur more frequently and with increased severity. This problem is becoming evermore relevant to not just people who live along coastlines, but people everywhere and that is why I designed FloodHelp. To help homeowners protect themselves from the potential impact of the natural world on their daily lives.